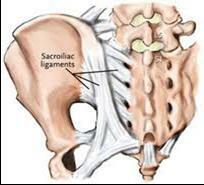 Sacroiliac joint (SIJ) dysfunction is often associated with pregnancy or post-partum mums, but can also be related to overuse injuries (repeated bending activities) or sporting incidents. The SIJ does not have a very large range of movement, but is an integral central component of the skeleton in full weight bearing (walking and running), and it is therefore essential that biomechanically the joint is moving in a coordinated fashion bilaterally. The SIJ is part synovial and part fibrous, and gains stability from both force closure (muscle actions around the pelvis) and form closure (the shape of the joint itself, including the irregular shape of the joint surfaces). 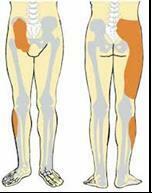 Pain is often local to the SIJ but may refer into the buttock and even down the posterior thigh. Groin pain is possible particularly if there is a pubic symphysis problem. Pain is often aggravated by standing, walking and running, although this is not always the case. A common complaint is pain when rolling over in bed. There are a variety of treatment options available to the physiotherapist which will depend upon the assessment findings but will most likely include mobilisation and/or stabilisation, correction of lumbo-pelvic muscle strength and length imbalances, and core stability exercises, bracing, taping, and RTUI for retraining lumbo-pelvic muscle function. It is often difficult to reproduce pain with movement testing unless specific SIJ tests are performed by a skilled practitioner. The patient is often tender over the SIJ’s and may demonstrate weakness of glut max and glut med with active movement testing.